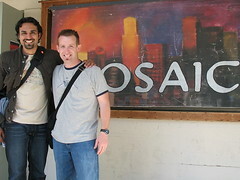 Naeem Fazal is pastor and church planter of Mosaic, Charlotte. This church was launched in Jan of 2006 and already has an attendance of over 1000 in 4 services. It is an amazing church that is utilizing movie theaters and bars to reach their community. Naeem was the one who turned me on to Mosaic and led to us becoming members of the International Mosaic Alliance. If you are ever in Charlotte, check them out.